WALTHAM, MA (September 20, 2018) — RTN Federal Credit Union and RTN GoodWorks Foundation presented a check for $21,000 to the Massachusetts Coalition for the Homeless on Monday, September 17. The funds are proceeds raised from Walk Home 2018, which took place in June. Walk Home, the Credit Union’s signature fundraising event, brings together RTN members and staff, along with community residents, local and state dignitaries and politicians, and business sponsors. 5K Walk events were held simultaneously in Danvers, Dorchester, and Waltham. “We are honored to partner with the Coalition and proudly contribute to its important work to help the estimated 42,000 children and teens who will experience homelessness in Massachusetts this year,” says Peter Cole, Board Member of RTN Federal Credit Union, Board Chair of RTN GoodWorks Foundation, and Quality Review Specialist, Quality & Patient Safety at Lawrence General Hospital. “We are grateful to RTN’s continued hard work and ongoing generosity through the annual Walk Home event to help us help homeless teens, individuals and families,” says Coalition Executive Director Robyn Frost. Walk Home funds are used to help homeless teens and families in Danvers, Waltham and Boston as well as support the work of the Coalition. Walk Home 2019 will take place on Sunday, June 9, 2019. Pictured (left to right) are: Viana Lucchesi, RTN Assistant Vice President of Human Resources; Joan Kuhn, Board Member of RTN GoodWorks Foundation; Robyn Frost, Massachusetts Coalition for the Homeless Executive Director; Sarita Ledani, RTN Vice President for Business Development and Executive Director, RTN GoodWorks Foundation; Ann-Marie Gordon, RTN Vice President of Operations; Ann Kane, RTN Mortgage Closer; and Nicole James, RTN Senior Vice President of Retail Services and Treasurer, RTN GoodWorks Foundation. RTN GoodWorks Foundation is a 501 (c ) (3) non-profit, public charitable foundation that fosters financial wellness, and promotes financial literacy and community involvement. 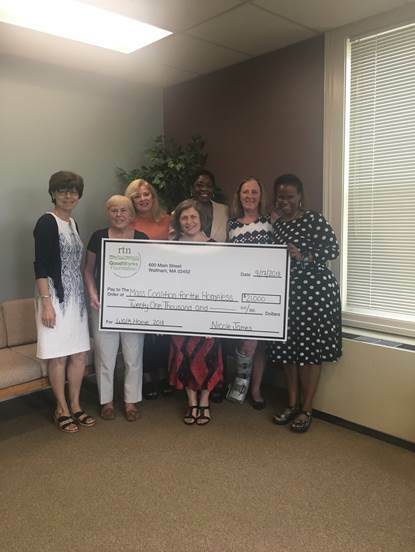 Founded in 2011, the RTN GoodWorks Foundation is a natural outgrowth of the Credit Union’s commitment to community activities and financial literacy as a key component of financial health.